To Cite: Sosa-Jurado F, Hilda Rosas-Murrieta N, Guzman-Flores B, Perez Zempoaltecalt C, Patricia Sanchez Torres A, et al. Prevalence of Serologic Hepatitis B Markers in Blood Donors From Puebla, Mexico: The Association of Relatively High Levels of Anti-Core Antibodies With the Detection of Surface Antigen and Genomic DNA, Hepat Mon. 2016 ; 16(6):e36942. doi: 10.5812/hepatmon.36942. Background: The hepatitis B virus (HBV) causes chronic hepatitis, hepatic cirrhosis, and hepatocellular carcinoma. Surface antigen (HBsAg) detection is a definitive test that can confirm HBV infection, while the presence of antibodies against the core protein (anti-HBc) suggests either a previous or ongoing infection or occult hepatitis B infection (OBI). Objectives: The aim of the present study was to determine the prevalence of anti-HBc and HBsAg in blood donors. Further, the study aimed to estimate the anti-HBc level at which HBV DNA is detected in putative OBI cases, as well as to search for mutations in the “a” determinant associated with the non-detection of HBsAg in serum. Patients and Methods: We conducted a cross-sectional study from 2003–2009. The study included 120,552 blood donors from the state of Puebla, Mexico. Different commercial systems based on microparticles (enzymatic (MEIA) or chemiluminescent (CMIA)) were used to determine the HBsAg and anti-HBc levels. For the detection of HBV DNA, a nested polymerase chain reaction (nested PCR) was used and the genotypes were determined using Sanger sequencing. Results: Of the 120,552 blood donors, 1437 (1.19%, 95% CI: 1.12 - 1.26) were reactive to anti-HBc, while 82 (0.066%, 95% CI: 0.053 - 0.079) were reactive to HBsAg. Some 156 plasma samples collected in 2009 from anti-HBc-positive/HBsAg-negative blood donors were submitted for HBV DNA detection in a search for probable OBI. Viral DNA was detected in 27/156 (17.3%, 95% CI: 11.5 - 23.1). Our results show an association between HBV DNA or HBsAg and anti-HBc S/CO levels ≥ 4.0. All DNA samples were identified as genotype H and some “a” determinant mutations were identified, although none corresponded to mutations previously reported to hinder the detection of HBsAg by commercial immunoassays. Conclusions: We observed that as the anti-HBc levels increase, there is a higher prevalence of the viral protein HBsAg in blood donors. Samples testing positive for HBV-DNA were seen to exhibit a ten-fold higher presence of anti-HBc S/CO ≥ 4 than those with S/CO ≥ 1 and < 4.0, which highlights the relevance of anti-HBc determination in blood donor samples. The hepatitis B virus (HBV) causes chronic hepatitis, hepatic cirrhosis, and hepatocellular carcinoma. It is estimated that one third of the world’s population has been infected with HBV (1). Indeed, ~350 million people are said to be currently infected, with a fraction of them unaware of their condition (1). Surface antigen (HBsAg) detection in serum is the most common definitive test for HBV infection, although it does produce early false negatives, since its detection accuracy improves one to three months post-exposure. Chronic HBV infection is characterized by the persistence of HBsAg for more than six months, in addition to the presence of HBV DNA in serum (1-3). Some 80% of chronically infected subjects are unaware of their infection due to its silent nature. Additionally, a small number of HBsAg-negative individuals suffer from a so-called “occult HBV infection” (OBI), which is defined by the presence of HBV DNA in the liver (with detectable or undetectable HBV DNA in the serum) of patients with serological markers (anti-HBc and/or anti-HBs positive) or in patients without serological markers (anti-HBc and/or anti-HBs negative). The detection of anti-HBc in the serum of HBsAg-negative individuals is a marker suggestive of OBI, which is useful in the absence of a liver biopsy (2, 3). In Mexico, studies of adult infection and carrier status have yielded a seroprevalence of 3.3% for anti-HBc and 0.21% for HBsAg (4). Only a few studies of OBI have been reported in Mexico. For instance, a study conducted among the Nahuatl and Huichol ethnic groups found an OBI prevalence of 14.2% (5), whereas studies of blood donors have reported a prevalence of 6.4% (6) or 8.2% (7). The aim of this study was to determine the presence of HBsAg and anti-HBc antibodies in blood donors from Puebla, Mexico over a seven-year period. The study also aimed to detect HBV DNA in serum samples collected during the last year of the study (i.e., 2009). To determine whether the anti-HBc antibody levels may serve as a criterion for suspecting OBI, the anti-HBc S/CO range in HBV DNA-positive subjects was estimated. Additionally, we searched for mutations in the “a” determinant of HBsAg in order to explore the association with the failure to detect HBsAg. The present study had a diagnostic cross-sectional design. It included 120,552 blood donors recruited at ten sampling sites distributed throughout the state of Puebla, Mexico, as well as the blood bank of the national health centre “Manuel Avila Camacho” (Instituto Mexicano del Seguro Social). From 2003 - 2009, all donors were subjected to routine blood bank testing (ABO group and Rh type, complete blood count, non-ABO/RhD alloantibodies, anti-HCV, anti-HIV 1-2/Ag p24, anti-HCV, anti-HBc, HBsAg, anti-Treponema pallidum, anti-Trypanosoma cruzi, and anti-Brucella sp) according to the Mexican standard NOM-003-SSA2-1993, which was current until 2011 (updated as NOM-253-SSA1-2012) and included mandatory screening for HBsAg. In 2001, the detection of anti-HBc was added to the blood bank testing. The study was performed in accordance with the ethical regulations approved by the local research and health ethics committee #2101 of the Mexican institute of social security (protocol R-2010-2101-31). All study procedures were in line with the principles of the declaration of Helsinki. An AxSYM CORE (Abbott, Wiesbaden, Germany) system was used from 2003 - 2007. The system performs a microparticle enzyme immunoassay (MEIA) that detects anti-HBc antibodies. Samples with S/CO values ranging from 1.001 - 3.000 are considered negative, while those with S/CO values ranging from 0.000 - 1.000 are considered reactive. The ARCHITECT Anti-HBc (2008) and ARCHITECT Anti-HBc II (2009) (Abbott, Wiesbaden, Germany) systems were also used in this study to perform chemiluminescent microparticle immunoassay (CMIA) tests to detect anti-HBc antibodies. In CMIA tests, samples with S/CO values ≥ 1.0 are considered reactive. The collected samples were analyzed with the AxSYM HBsAg (V2) system (Abbott, Wiesbaden, Germany) from 2003 - 2007. The system is a third-generation MEIA that uses monoclonal anti-HBs (IgM). Samples with S/CO values ≥ 1.0 are considered reactive. The ARCHITECT HBsAg system was used from 2008 - 2009. It is a CMIA test that uses monoclonal anti-HBs (IgG and IgM). For this test, samples with S/CO values ≥ 0.05 IU/mL are considered reactive. In 2009, 255 donors were determined to be anti-HBc(+)/HBsAg(-) and their samples were preserved at -70°C for further analysis. Any samples that were reactive to other viruses such as HCV or HIV or insufficient for molecular tests were discarded, and thus only 156 samples were analyzed for HBV DNA. Only the samples from 2009 were accessible for further molecular analysis and hence samples from prior years were not included in this part of the study. DNA was extracted from the plasma samples using a commercial NucleoSpin Plasma XS system (Macherey-Nagel GmbH and Co. KG, Düren, Germany). A fragment of the HBV genome (S region) was amplified by simple or nested polymerase chain reaction (nested PCR) using the primers Jol43 (5’-GCT CGT STT ACA GGC GGG GTTT TTC TT-3’, nt 190 - 216) and Jol44 (5’-GGG ACT CAA GAT GTT GTA CAG ACT TGG-3’, nt 787 - 761) for the first round of PCR (598 bp) (8). The primers HB-NF1 (5’-CAA TCA CTC ACC AAC CTC CTG T-3’, nt 331 - 349) and HB-NF2 (5’-ACT GAG CCA AGA GAA ACG GAC T-3’, nt 676 - 655) were used for the second round of PCR (346 bp). The nested PCR was performed in duplicate for all samples and the reaction products were analyzed using 1% agarose gel electrophoresis. This homemade PCR has a detection limit of 50 copies/mL (unpublished results). The nt numbers for the localization of the primers correspond to GenBank Accession Z35717.1 of HBV. The PCR products (346 bp) were sequenced in both senses with the BigDye Terminator cycle sequencing kit v2.0 and the ABI Prism 310 gene analyzer (Applied Biosystems, Foster City, CA) using the same primers as for the nested PCR. Multiple sequence alignments were performed using ClustalW. Phylogenetic trees were constructed using the neighbor-joining algorithm (9) with bootstrap values determined by 1000 replicates. For these genetic analyses, MEGA 5.1 software was used (10). The ExPASy translate tool (ExPASy: SIB Bioinformatics Resource Portal, http://web.expasy.org/translate/) was used to predict the amino acid sequences coded in the PCR products. We compared the HBV sequences from our study to the following sequences obtained from GenBank: seven sequences of the HBV genotypes A-G (Accessions: FJ692572.1, AB602818.1, AB644286.1, EU594396.1, EU239226.1, FJ657519.1, and AB375165.1), ten sequences of the HBV genotype H from Mexican patients (AB516395.1, AB375162.1, AB375159.1, AB375160.1, AB375164.1, AB375161.1, M117850.2, HM066946.2, HM117851.2, and AB375163.1), two sequences of the HBV genotype H from Mexican patients with OBI (AB516393.1 and AB516394.1), two sequences of HBV isolated from a chimpanzee (AF242586.1), and one isolated from a woolly monkey (AF046996.1). All results were expressed as mean and 95%CI. The comparison of the prevalence for different years and the association between anti-HBc S/CO and HBV DNA detection were analyzed with the Chi-square test. 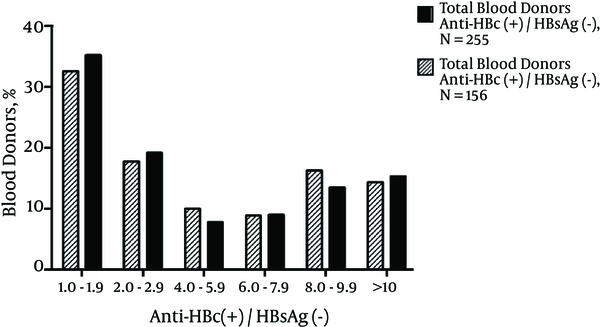 The comparison of the anti-HBc S/CO values between the original anti- blood donors determined as HBc(+)/HBsAg(-) (n = 255) and the selected samples (n = 156) from 2009 was performed with the Mann-Whitney U test. All calculations were performed using GraphPad Prism 5 (GraphPad Software, La Jolla, CA, USA). From 2003 to 2009, a total of 120,552 blood donors were included in this study; 77,565 samples were analyzed using a AxSYM CORE system (2003 - 2007), while 20,636 were tested by ARCHITECT anti-HBc (2008) and 22,351 by ARCHITECT anti-HBc II (2009). Some 1437 blood donors were reactive to anti-HBc, resulting in a prevalence of 1.19% (95% CI: 1.12 - 1.26). In 2003 and 2004, the prevalence values were 1.17% (95% CI: 0.99 - 1.35) and 1.05% (95% CI: 0.89 - 1.21), respectively, decreasing to 0.64% (95% CI: 0.53 - 0.75) and 0.57% (95% CI: 0.45 - 0.69) in 2005 and 2006, respectively. In 2007, the prevalence was 0.72% (95% CI: 0.60 - 0.84) (Figure 1A). Comparing the values for each year, we found that the 2003 prevalence was not significantly different from the 2004 prevalence (P = 0.872), while the 2005 prevalence was significantly lower than that of 2004 (P = 0.007). The 2006 (P = 0.482) and 2007 (P = 0.576) prevalence rates were also significantly lower than the 2004 prevalence. There were no significant differences (P = 0.956) between the prevalence in 2005, 2006, and 2007. In 2008, samples from 20,636 blood donors were analyzed and 534 were found to be reactive, representing a prevalence of 2.59% (95% CI: 2.37 - 2.81). In 2009, 22,351 samples were analyzed and 270 were found to be reactive, resulting in a prevalence of 1.20% (95% CI: 1.05 - 1.35) (Figure 1A). The prevalence of 2.58% in 2008 was significantly higher (P = 0.0001) than that in 2009 and with respect to the other years studied (P = 0.0001). 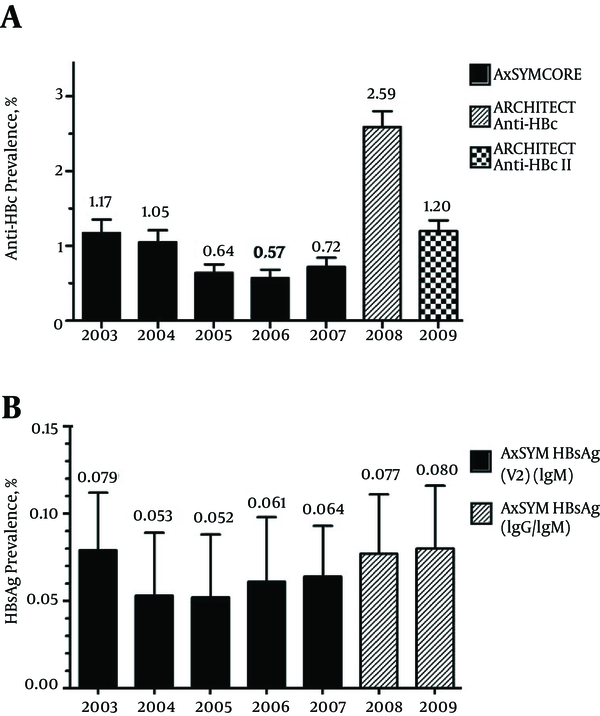 Anti-core antibodies were determined using an AxSYM CORE system (MEIA) from 2003 - 2007 and by ARCHITECT Anti-HBc (CMIA) and ARCHITECT anti-HBc II (CMIA) in 2008 and 2009, respectively. HBsAg was determined by a third-generation AxSYM HBs (V2) (MEIA) in 2003 - 2007 and by ARCHITECT HBsAg (CMIA) tests in 2008 and 2009. Of the 120,552 donors studied during 2003 - 2009, a total of 77,565 were analyzed by AxSYM HBsAg (V2) (IgM) from 2003 to 2007 and 42,987 by ARCHITECT HBsAg (IgG/IgM) from 2008 to 2009. Eighty-two blood donors were found to be HBsAg reactive, representing a prevalence of 0.066% (95% CI: 0.053 - 0.079). In 2003, the prevalence was 0.079% (95% CI: 0.033 - 0.125), with a slight decrease to 0.053% (95% CI: 0.017 - 0.089), 0.052% (95% CI: 0.016 - 0.088), 0.061% (95% CI: 0.024 - 0.098), and 0.064% (95% CI: 0.027 - 0.101) in 2004, 2005, 2006 and 2007, respectively. In the following years, an apparent increase was exhibited, with a prevalence of 0.077% (95% CI: 0.040 - 0.110) being found in 2008 and 0.080% (95% CI: 0.043 - 0.117) in 2009 (Figure 1B). There was no significant difference among the prevalence values within either of the periods 2004 - 2007 (P = 0.998) or 2008 - 2009 (P = 0.999). Of the 82 HBsAg-positive blood donors in the studied period, 74 (90.2%) were also reactive to anti-HBc, while only eight donors (9.8%) were reactive exclusively to HBsAg. The level of anti-HBc (II, CMIA) estimated by the S/CO ratio values was different between the blood donors only reactive to anti-HBc and those reactive to both anti-HBc and HBsAg. For this analysis, only data from 2009 were used. A total of 255 blood donors were reactive to only anti-HBc, whereas 15 (5.5%) were reactive to both anti-HBc and HBsAg. Some 129 blood donors had S/CO levels ≥ 1 and < 4.0, of which only one (0.78%) was reactive to HBsAg. In contrast, of the 141 blood donors with S/CO levels ≥ 4.0, 14 (9.9%) were reactive to HBsAg. A significant difference was observed between the anti-HBc S/CO levels ≥ 4.0 and < 4 in the presence of HBsAg (P = 0.031) (Table 1). The proportion of HBsAg positive samples is 12 times higher in the samples with an S/CO level ≥ 4 than in those with an S/CO level ≤ 4.
aData corresponds to blood donors analyzed by anti-HBc II in 2009 only, since DNA HBV was determined by nested PCR. Data were analyzed using the Chi-square test. The number of subjects and percentage are represented as No. (%). The anti-HBc (II, CMIA) S/CO ratio was related to the detection of HBV DNA. In the 156 blood donors found to only be reactive to anti-HBc (II, CMIA), the S/CO ratio was associated with the presence of HBV-DNA. Of the 88 blood donors with S/CO levels ≥ 1 and < 4.0, only three (3.40%) were HBV DNA positive. In contrast, of the 68 blood donors with S/CO levels ≥ 4.0, 24 (35.3%) were HBV DNA positive. A significant difference was therefore observed between the anti-HBc S/CO levels ≥ 4.0 and < 4 in the presence of HBV DNA (P = 0.0001) (Table 1). The proportion of DNA positive samples is ten times higher in samples with a S/CO level ≥ 4 than in those with a S/CO level ≥ 1 and < 4.0. Of the 255 anti-HBc(+)/HBsAg(-) samples identified in 2009, 156 were found to be optimal for HBV DNA detection (enough sample available, not reactive to other viruses). The anti-HBc levels of this subgroup were compared to those of all 255 donors and no significant differences were found (P = 0.057; plotted in Figure 2). Therefore, we conclude that the subgroup of 156 donors is representative of the group of 255 donors. Viral DNA was detected in 27 of the 156 blood donors reactive to only anti-HBc (II, CMIA), which represents a prevalence of 17.3% (95% CI: 11.5 - 23.1). The 598 bp PCR product was detected in two subjects, whereas the 346 bp nested PCR product was detected in 25 subjects. All PCR products for the 27 HBV DNA-positive blood donors were sequenced, and the sequences obtained were localized in the same arm of the HBV genotype H (Figure 3). Sequences of the HBV S region from Mexican blood donors were submitted to GenBank and the accession numbers assigned ranged from KP998488 to KP998514. A comparison of the total number of seropositive donors found in 2009 (N = 255) with the subgroup further analyzed in the search for HBV DNA (N = 156). For these genetic analyses, MEGA v.5.1 software was used. The S region sequence obtained via PCR comprises amino acids 73 - 169 and includes the “a” determinant (residues 124 - 147). Four variations were detected in this sequence: R122K, P127L, and Y134F, which are located at residue positions where mutations associated with OBI have been previously reported (11), and I126T, which is similar to a mutation previously associated with the non-secretion of HBsAg in vitro (12). None of these changes have been associated with a decrease in the analytical sensitivity of commercial HBsAg diagnostic systems (Table 2). aReferences for each list of amino acid variations are shown in parentheses. Overall, the HBsAg prevalence in blood donors was 0.066% throughout the studied period, which is below the range reported by most studies of blood donors during the last decade in several Mexican states: 0.23% (15), 0.30% (16), 0.20% (17), 0.18% (18), 0.057% (19), and 0.216% (20). In these studies, the presence of anti-HBc was not analyzed; however, the overall anti-HBc prevalence of 1.19% was lower than that found in two other studies of Mexican blood donors (4.42% (6) and 1.82% (7)) and almost one third of the 3.3% prevalence reported for Mexican adults with different socioeconomic status (4). Among the Huichol and Nahuatl ethnic groups, a prevalence as high as 33% has been found (5), whereas the prevalence of anti-HBc in rural Mexican communities reaches 3 - 20 times the national average (21). This difference may be explained by the fact that blood donors represent a biased population due to the implementation of questionnaires designed to exclude individuals with the risk factors for blood-borne diseases. Antibodies against the core antigen (i.e., anti-HBc) indicate a history of infection. They appear in the acute phase of the infection, generally persist for the entire lifespan of an individual, and indicate HBV infection independent of the stage (acute, chronic, or recovered). Individuals with only a serological anti-HBc pattern can potentially transmit HBV (22) in a similar way to HBsAg reactive individuals, which correlates with the chronic carrier status of the infection. Thus, the use of a single serological marker such as HBsAg does not eliminate the residual risk of HBV transmission. Several studies have shown that the presence of anti-HBc may be associated with OBI. The occult infection due to HBV is subsequent to acute hepatitis, leading to a state in which the HBsAg levels disappear and the biochemical parameters of the liver stabilize (23). Therefore, the detection of anti-HBc is now recognized as a marker of exposure or as being suggestive of occult infection (24). The failure to detect HBsAg may have several molecular explanations (25) such as the presence of variants of the protein, essentially in the “a” determinant, which can escape antibody recognition in diagnostic tests. With a very low viral load, it is often possible to find that the viral genome in blood donors is only reactive to anti-HBc, with no detectable HBsAg, which may be due to the low HBsAg expression (22, 26, 27). In the present study, we detected HBV DNA in 17.3% of the 156 samples from anti-HBc-positive/HBsAg-negative blood donors. In several studies involving blood donors, the viral genome has been detected in 0.5% to 17.2% of subjects with anti-HBc and undetectable HBsAg (28, 29). The widespread use of nucleic acid amplification technology (NAT) remains controversial, especially for HBV in blood donors, due to the very low viral load in OBI, which has been reported to be 11 - 25 IU/mL (30) and 100 - 800 copies/mL (31). A recent study of OBI cases showed that HBV DNA is often intermittently detectable (32). OBI is more common than the acute serological window period in Australian blood donors and probably also in individuals from countries with a low HBV prevalence (32). This highlights the complexity of confirming OBI, as well as the importance of including anti-HBc in blood bank screening (32). In this study, the serum samples of HBsAg-negative but anti-HBc-positive blood donors with S/CO levels ≥ 4 had a higher probability of testing positive for viral DNA (24/68), whereas in samples with S/CO levels ≥ 1.0 to < 4.0, the probability was significantly lower (3/88) (Table 1). All 27 positive PCR samples fell within genotype H, which was determined by direct sequencing. In other studies involving Mexican patients, genotype H has been reported to be the most common genotype, although its prevalence varies between 50% and 75% (7, 33). The PCR sequences were analyzed to search for mutations within the “a” determinant of the S protein, which have been associated with diverse characteristics such as the decreased analytical sensitivity of commercial HBsAg diagnostic systems or the presence of OBI (Table 2). Changes in the coding sequence associated with OBI were observed, although the nucleotide changes are different from those previously reported (11). The specific substitutions found in the current work were R122K, P127L, and Y134F. We also found the change I126T, similar to the mutation I126S, which was previously associated with no secretion of HBsAg in vitro (12). Mutations associated with recombinant HBsAg (13, 14) that decrease the sensitivity of immunoassays (12) or that have been reported in asymptomatic Mexican blood donors (34) were not detected in our sequences (Table 2). Therefore, the failure to detect HBsAg in our study may be due to the low expression of this protein. Due to the importance of both anti-HBc and HBsAg for blood donor screening, we analyzed the association between these serological markers. Anti-HBc (II, CMIA) reactive samples with detectable HBsAg were located alongside S/CO levels ≥ 4.0 in 14 out of 141 blood donors, whereas in samples with S/CO values ranging from ≥ 1.0 to < 4.0, HBsAg was detected in only 1 out of 129 blood donors (Table 1). It may be predicted that an increase in anti-HBc S/CO values is associated with the increased detection of HBsAg. The WHO recommended that each country should establish its own strategy for reducing the residual risk of transfusion-associated HBV transmission (22). Mexico is a country with a low incidence and prevalence of HBV infection (4, 35), as are most countries in the Americas (36); however, it is necessary to consider that the use of HBsAg alone as a serologic marker is insufficient to detect infection in all blood donors. The present study, together with other studies involving large adult populations (4, 21), show the relevance of also using anti-HBc as a serological marker in this scenario. In Mexico, the average age of death due to liver cirrhosis is 55.2- to 59.1-years-old. The states of Puebla, Queretaro, Veracruz, Hidalgo, and Oaxaca have the highest mortality rates, with the main etiological agent being alcohol intake (37). The hypothesis of the homeostatic state between the human host and HBV proposes the adaptation of patients to the asymptomatic state for many years, although factors such as alcohol consumption may decrease the time to cirrhosis development. Recently, it has been shown that an anti-HBc-positive/HBsAg-negative status is associated with more advanced liver disease in alcoholic patients with cirrhosis (38). Further, viral DNA has been detected in up to 41.9% of the native liver of patients with alcoholic cirrhosis who are undergoing liver transplantation (39). This suggests that OBI may be underestimated as a cause of cirrhosis in anti-HBc-positive/HBsAg-negative patients. The strengths of this paper are the inclusion of a relatively large population from the studied region, the fact that the results of either the MEIA or CMIA tests throughout the seven years of our study show only slight variations, and the fact that anti-HBc S/CO values > 4.0 are predictive of viral DNA positivity in 35% of samples. The limitations are that the studied samples come from a single region in Mexico and date back to 2003. However, our group will continue to study these important public health issues by including other regions and more recent samples. We wish to thank Paulina Cortes-Hernandez for her critical review and suggestions for this article. Authors’ Contribution: Study concept and design: Francisca Sosa-Jurado and Gerardo Santos-Lopez. Sampling and performance of analytical procedures: Belinda Guzman-Flores, Maribel Bernal-Soto, Daniel Melendez-Mena, and Miguel Angel Mendoza Torres. Design and analysis of molecular tests: Nora Hilda Rosas-Murrieta and Luis Marquez-Dominguez. Statistical analysis, drafting of the manuscript, and critique for important intellectual content: Veronica Vallejo-Ruiz, Julio Reyes-Leyva, Maribel Bernal-Soto, and Gerardo Santos-Lopez. Funding/Support: This work was supported by CONACYT SALUD-2011-01-161867 (FIS/IMSS/PROT/1038) and Funds for Scientific Infrastructure from the IMSS (CTFIS/10RD/12/2011).